The desired freedom of choice in pensions is much smaller than polls suggest. How much freedom of choice workers should get, is important in the ongoing debate about the development of the Dutch pension system. Harry van Dalen (NIDI, TiU) and Kène Henkens (NIDI, RUG, UvA) found that only a minority of employees value freedom of choice. The public debate about pensions often returns to the topic of freedom of choice. This is clearly seen as important by some, but what do employees themselves want? A custom-designed, in-depth survey among employees reveals that freedom of choice is not as important to most as the initial straw polls would suggest. Only a small minority of respondents (15%) feel a need for greater choice during the investment and accrual stage, and only 16% wish to see greater flexibility in terms of early withdrawal of the accrued entitlement. Just over a quarter (26%) would like a greater choice of pension fund, while 14% support more freedom of choice in the retirement package, and 18% favor more choice with regard to the investment of the pension capital. Respondents calling for greater choice in these areas can be characterized as having little confidence in the management of their existing pension fund, or who feel less solidarity with the other participants in that fund. Most employees have little objection to a system in which all pension-related decisions are left to the pension fund administrator. They may favor a system in which there is some freedom of choice, but do not necessarily wish to exercise that freedom. There could, for example, be a set of standard choices designed by the pension fund administrator, with certain preferred options or ‘defaults’. 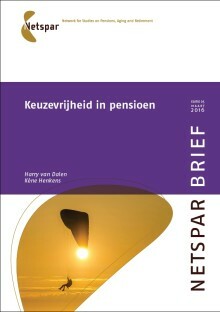 The Netspar Brief is only available in Dutch.